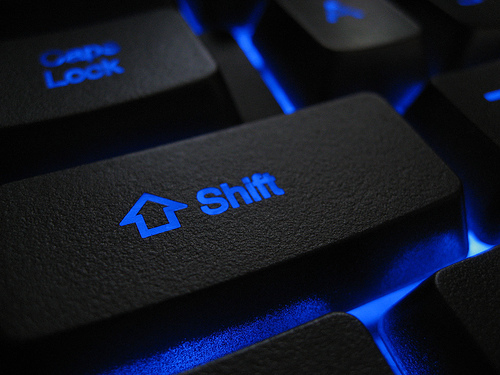 “SHIFT_. A single word that captures the passion and commitment that has revived and drives our future. Everything we touch, we shift. And everything we shift, we try to make better and uniquely Nissan. Original mindset: This weird, new tool has no value. Why would anyone care what I think? And who really wants to know what I had for lunch? Current mindset: This awesome tool keeps me connected to the world in real-time. News, humor, relevant articles – you name it, Twitter has it! It’s all about how you use the tools, not the tool itself. Ever used a sugar packet to level a wobbly table? It’s up to YOU to find the value! Original mindset: It’s the professional space online. I should be using it for business, connecting only to people I know. Oh, and I might as well copy what’s on my résumé into my profile. It’s the same thing, right? Current mindset: LinkedIn is valuable, but again, it’s all about how you use it. I use the platform to connect with people (and continue to connect with them after the initial invitation) in my network, along with people I’ve never met. WHAT? Connect with someone you DON’T know on LinkedIn? There’s value in doing this. Expand your network. We’re all connected by fewer links than you think! LinkedIn is also great for group participation and to establish credibility. Know the answer to someone’s question? Build your reputation! By the way, I still don’t link all my tweets to LinkedIn. For me, it’s distracting. Sure, I cross-post sometimes, but EVERYTHING isn’t worthy of LinkedIn. Know your platform and purpose. Original mindset: Facebook isn’t for me. Why? Actually, Facebook wasn’t available to me when it first launched (I’m not THAT old) and I didn’t have an .edu email address, which was required for users at that time. When the platform opened up its membership, I joined just see what everyone was talking about, connecting with long-lost friends and family members. I posted pictures…some weren’t too flattering. After all, who would use Facebook as a job seeking tool? Original mindset: What is this and why are people posting pictures of food or their newest craft project on Facebook? That feature can be turned off, by the way. Hint, hint. Why would I want to even entertain another social sharing tool? One platform I’m missing is Google+. I’m still in the infant stages of discovery with this tool. The original mindset is this: What makes it so special, so different than anything else out there? That’s the million dollar question that a lot of people are asking. You tell me – what do you think about Google+ or any of the other sites covered in this post? How are YOU using them for your job search? How has your mindset shifted? Please leave a comment below. I want to hear from you. I can absolutely relate to your attitude toward Facebook, only my “illness” was Twitter. It took me some time to realize it’s potential. Twitter is great, but none of the tools are “one size fits all.” It’s all about what makes the most sense for you! Thanks for the comment. What is the difference?? I only have an instagram (by the way its #kenliluvsya2) but my friend recently told me to get a pinterest but what is the difference? Instagram was designed for users to share pictures with their friends, allowing them to tweak the photos with stylish and creative filters, giving it a retro look. Instagram is only available to iPhone users and creates an online profile that friends can like and share. Pinterest was designed for users to share things they like (recipes, craft ideas, fashion, etc.) thus creating an online “personality snapshot” of the user. Pinterest users can repin things their friends like to specific boards, or collections. This isn’t a board for sharing photos per se, like Instagram, but you might want to share some of your more creative ones. Hope that helps. They’re not the same and they’re not really too different. It all depends on how you use them!